On a fateful day in January 1991, JoAnna Lund finally decided to give up dieting and change her life for the better - and forever. Inspired by her family and strengthened by her faith, she went on to recapture her own health and vitality - and to create the phenomenon of Healthy Exchanges. Now, because she maintains that the food we prepare can be an expression of both love for others and belief in the future, she has written a book to nourish both the body and soul. With her approach to creating easy-to-make healthy dishes and her workds of wisdom and comfort, JoAnna Lund has fulfilled her wish to establish a place - both physical and spiritual - that provides a real sense of belonging. This place is the joyful table. And she invites everyone to share in the things that have made a joyful life possible for her. Make a Joyful Table embodies all the old-fashioned values sacred to the author: the love of family, of country, and of God. But is is as up-to-date and as relevant today as the new healthy food products and modern kitchen conveniences that she relies on for making Healthy Exchanges fare. In addition to the more than 175 original recipes, the book offers dozens of menus to help make every meal a reason to celebrate. Particularly unique to this book are the messages of encouragement and inspiration, the stories of sharing and caring, and a satisfying portion of JoAnna Lund's common folk advice to help everyone along the way to health and happiness. 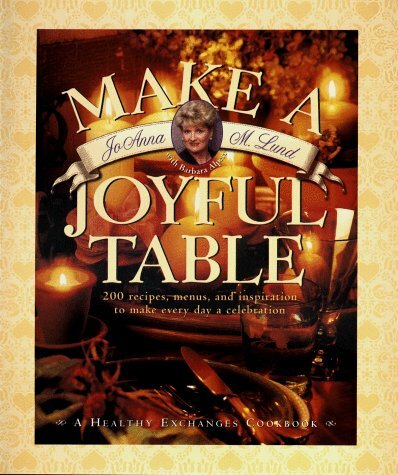 JoAnna Lund is the author of several cookbooks, including Helthy Exchanges Cookbook, HELP, and Dessert Every Night. A popular speaker with weight-loss and health-support groups, she has been profiled in national weight-loss magazines and newspapers, including People, and has appeared on television and radio throughout the country. She lives in DeWitt, Iowa.